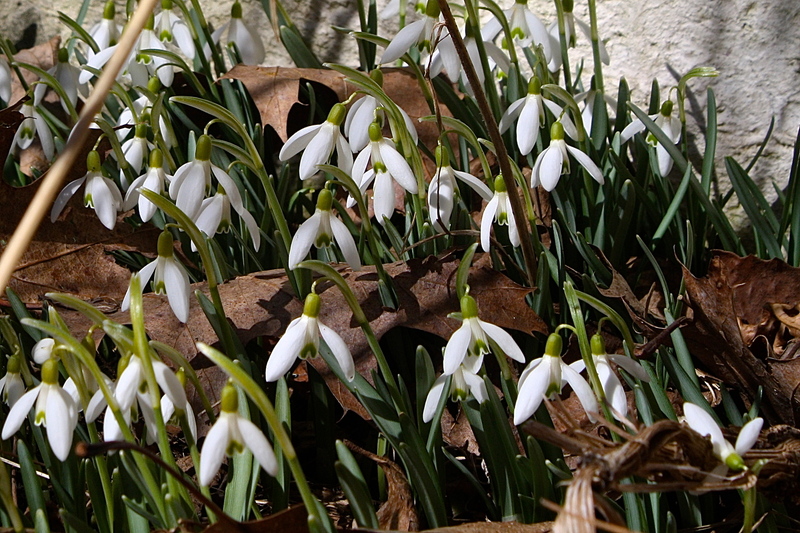 Snowdrops boldly announce the end of winter! While they have gladly self-sowed themselves around my yard, these next to the foundation come up while most of the yard is still covered with snow. Sweetly fragrant, they perfume the air near my front steps where I sit in the sun, gathering Vitamin D into my sun-starved body. I inhale deeply the rich scent of musty-sweet, thawing earth. In a rush, I am transported back to childhood when I lived close to the earth and played all day in the fresh air, inventing games with tiny troll dolls in little streams that formed from melting snow. It was a sweet time, when there really was no ‘time’, only the present moment in which to indulge my senses in the pungent smell of earth, feeling the kiss of the sun while listening to the songs of birds heralding the coming of spring. 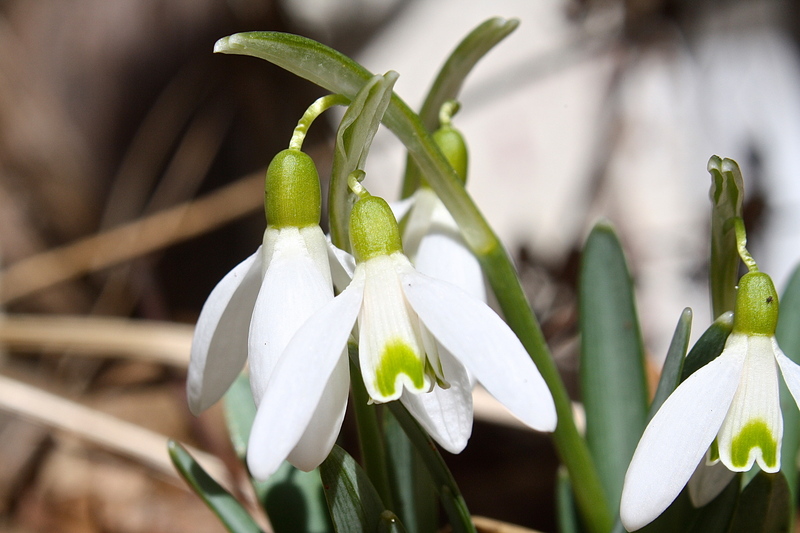 This entry was posted in Country Gardening, My Photos and tagged childhood, Galanthus nivalis, gardening, gardens, memories, photography, reminiscence, snowdrops, spring, troll dolls, winter's end. Bookmark the permalink. They are lovely, a flora that is very unknown to me but maybe one day I shall see. Really, really lovely. I was transported to your childhood spring. Although they will live on their own undivided, if you do divide them, replenish the soil with compost and space each bulb three inches apart, they will grow larger and flourish compared to their undivided kin. What a welcome sight! Wish I was seeing it in Minnesota . . .
Gee, I thought I was the only one that still had snow. Hope spring flowers will be coming soon for you! Beautiful pictures of a flower I don’t think I’ve ever seen. And, a great post that took me back to my own childhood, walking through the dirt in Arizona, marveling at the sparkling flecks in the soil, astonished to find shells. I always attributed the sense of magic to my being so much closer to the ground, and able to see treasures no one else could see. Funny, but I really did think it was being short, not being a child! Kids see without the filters we adults have acquired over the years. It is a daily practice for me trying to recapture a child’s view of the world, unblemished and pure. Not always easy! Arizona, huh? You really are a SW girl– No wonder you don’t mind the heat and shun the cold! Were the shells you found fossils from the inland sea? I wish I knew how the shells got there. But I found lots of them. Pure white, smallish, but looked like clam shells otherwise. Yes, Arizona to Los Angeles was a shock. We moved in August, and I nearly froze. Lovely posting. Last fall I planted snowdrops on the grave of my newly-lost & beloved dog, Jewel. I look forward to seeing them (& in a way, her) rise up this spring. What a lovely way to keep her memory alive. Sweet Jewel, she was a special angel. Oh soooo pretty…I am out in the sun ,too…it feels wonderful! Are they native to UK+ are they bulbs? Fragrant…hmmm that made me want them for spring!I forgot to mention before, I like your new banner. It makes me want to jump through the screen, and walk down that beautiful road with all the maple syrup flowing! Thanks, Robbie. 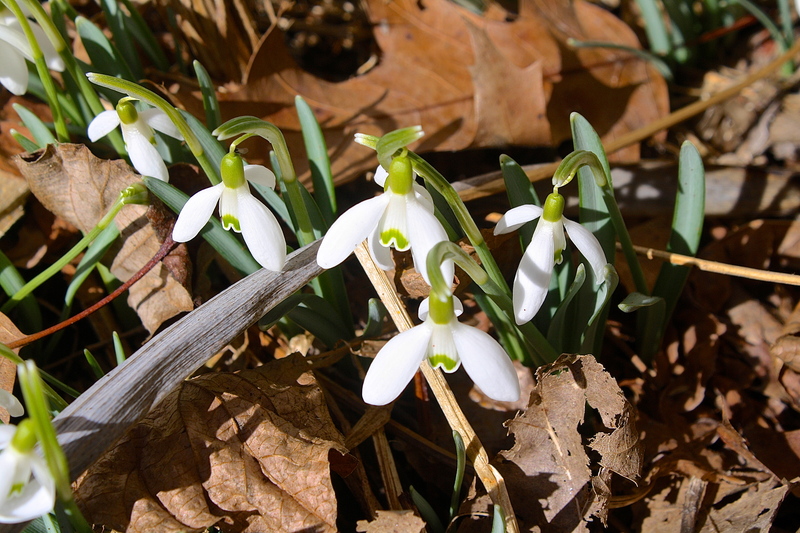 Galanthus are native to Europe, but naturalize wherever they are planted. Heck, I’ll send you some when they go dormant in May. I have a ton. Sweet comment about the road…I love walking this particular stretch because of the maples and at the end you see here is a field that overlooks our little valley, so lovely a blessing! Thanks Fi, I almost can’t believe that spring is finally here! One of the best scents in the entire world is damp soil. I will race outside to catch that scent when it first starts to rain after a dry spell. Thanks for visiting my blog. I enjoyed seeing your posts as well. Good thoughts and some great shots exploring different points of view!